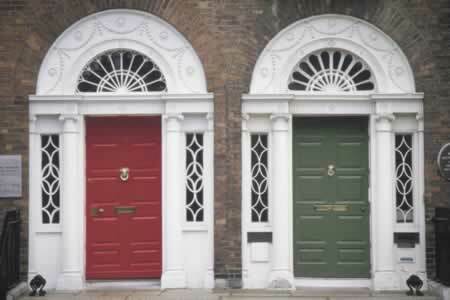 Panel doors can lend your row-house or townhouse just the right distinctive qualities to stand out to your visitors. Around America, and around the world, terraced houses celebrate a long history of employing six-panel doors that offer strength and long-lasting protection against the elements. Modern panel doors can also be insulated to provide energy efficiency and noise protection. In this stunning example, neighboring townhouses differentiate themselves with panel doors of contrasting colors. The lintels, lites, and sills are virtually the same. But the resemblance ends with the dramatic choice in color. Each homeowner has selected hardware that fits the period, but with modern amenities. Digital keypads mean you won't worry about losing your keys or having them stolen. The doors are hinged to open from opposite sides of the neighbor's entry. Whether your townhouse is in Baltimore, New Orleans, New York, or San Francisco, a low-maintenance panel door may be your best choice.